Shoes have always been quite a tricky item to shop. There are many factors besides their appearance that should be considered. They should match your size, preferences and most importantly, support your feet the best way possible. Here is how to make sure you always buy the right shoes. Even though this sounds as a no-brainer, size is one of the most important things that should be considered. For starters, you need just three things – a blank sheet of paper, measuring tape and a pencil. Place your foot on a sheet of paper – ideally while wearing a pair of socks you usually wear with shoes, and make a mark at the tip of your big toe and at the back of your heel. 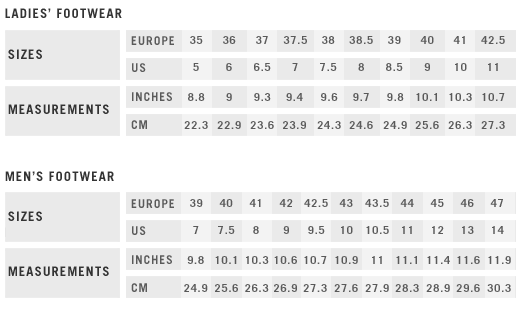 Measure the length and compare it to the size chart of the store. However, have in mind that your feet are not the same size, usually the right one is a little bit bigger. So firstly, make sure you measure both of your feet, and consider the measure of the larger one. The world should revolve around protecting the consumers. When you’re searching for quality women’s shoes online – the first thing you should consider before clicking that ‘buy’ button is site’s return policy. After all, no matter how beautiful and dreamy those shoes are, if they are not your size or are just plain uncomfortable, they are completely useless – in which case, you’ll want to return them and order other ones. And while most shoe stores offer reasonable return policies, some just don’t, and this is something you definitely want to know beforehand. Buying comfortable and supportive shoes is an investment for your foot health. Start off with your own feet and look at what you already have in your closet. Take them one by one and place them on the top of your foot drawing. You will notice that your comfortable shoes match the outline of your foot most closely. Next, identify those that cause pain. Usually for women these are shoes with narrow toes or really high heels. Check to see if the toe of the shoe is narrower or shorter than your toes. And once you are ready to replace your uncomfortable footwear, here are some tips that will help. First, when shopping for shoes, wait until the afternoon, because our feet are naturally expanding during the day and may even swell in hot water. Next, wear socks that you intend to wear with the shoes you are buying. Ask the salesperson to measure your feet and once you try the shoes on – stand. Make sure there is at least a half inch space between your longest toe and the end of the shoe (if your index finger can fit inside, you’re good). Check the soles to determine are they sturdy enough to protect your feet from sharp objects and do they provide cushioning. Finally, walk around a little bit to determine how they feel. Do they feel snugly or pinch or tend to slip off? Trust your own level of comfort. Walk on both carpet and hard surfaces to see how they react against impact. General advice is to mostly focus on materials that breathe and don’t trap moisture. To check the other quality properties of the shoe, firstly bend the front part of the shoe upwards – only one third should bend while the rear two should be stronger and difficult to bend. Next, grab the front and the back part of the shoe and try twisting it – the quality shoe shouldn’t be easily deformed. Press the shoe against its back spine and squeeze the sides that support the heel in order to check are they strong enough and not easily deformed. Finally, check all the stitching both inside and out. Make sure you have all these tips in mind next time you go shoe shopping. They will save you so much money, time and nerves. You have the right to know what you are spending your money on – always remember that.